Today’s post will cover a news clipping which describes Dr. Lee-o-netto’s funeral service. I received this from Margaret Parker of the Allegany Area Historical Association. A big thanks to this organization in helping to preserve the pieces of history. Funeral attendees are important to research. You never know when a previously unknown relative will attend and lead to additional discoveries. Even if there are no new relatives, I may stumble onto some new information that helps me understand my research subject better. Funeral services for Dr. Lee-O-Nett-O who died here last week Tuesday, were held at her late home on West Main street last Thursday afternoon at two-thirty o’clock. Very Rev. Joseph Grooves, rector of St. Stephen’s Episcopal church of Olean, officiating. The remains were laid to rest in the Allegany cemetery. The pall bearers were Clare L. Bockmier, Edward F. Smith, Karl S. Dornow, Howard Schultz, Albert B. Collins and Forest M. Wing. Among those from out of town attending the funeral were Mr. and Mrs. Leon Horton, Sr., Mr. and Mrs. Leon Horton Jr., Mis Jean Horton, Miss Florence Horton, Lawrence and Clarence Horton, Mr. and Mrs. Clifford Blood , East Randolph; Mrs. A. F. Hopkins, Bradford. For the most part this is a typical funeral notice. What caught my attention was the fact that neither Leon Horton nor any of his son’s were pall bearers. This is usually a family chore. I also did not see Charles Mosman or John Fowler listed as pall bearers despite the known connections their wives had with Lee-o-netto. So, just who are these men that served as pall bearers? Her death occurred in 1939, so I can look at the 1940 and 1930 census to learn more about them. I also know there are Cattaraugus County directories available for the 1920s, 1930s, and 1940s, so it shouldn’t take too long to check on these men. Clare L. Bockmier – b.abt.1895, in 1939 he is listed as the President of the Olean Trust Co., located at 129 N Union St. His residence is 113 N 10th. Lee-o-netto did not have money in this bank at the time of her death, but may have had other business with the bank. Edward F. Smith – b.abt.1873, in 1939 he is living at 12 N 2nd and is referred to as an oil producer in the local directory. Census records suggest he was a merchant of dry goods, which he appears to have retired from. When Lee-o-netto first moved to Allegany around 1915, Mr. Smith was operating a general store on E Main and living on 1st near Main. Karl S. Dornow – b.abt.1893, in 1939 he is a druggist at 96 W Main and his residence is 45 N 4th. Howard H. Schultz – b.abt. 1893, in 1939 he is a part owner of Smith & Schultz, a general merchandise store located at 120 W Main with a residence of 161 N 2nd. His business partner is Clarence Smith, son of Edward Smith mentioned above. Albert B. Collins – b.abt. 1903, in 1939 he is a part owner of Collins Brothers, a monument business located at 15 E Main with a residence at 16 N 6th. It seems reasonable to believe the firm provided the beautiful monuments at Lee-o-netto’s gravesite. Forest M. Wing – b.abt.1898, in 1939 he is a grocer located at 107 W Main with a residence at 26 N 4th. How interesting! These men are all prominent local business men. Most of their businesses are located within a few blocks of Lee-o-netto’s home at 54 W Main, so it’s not unreasonable to believe these are the men she did business with on a regular basis. Their presence suggests Dr. Lee-o-netto was well thought of in her community. Even if the men served as pall bearers only because their wives were friends of Dr. Lee-o-netto, it still shows this lady was respected by the leading citizens of her community. That alone is worth every second of time spent researching these men. I was also unable to determine who Mrs. A. F. Hopkins of Bradford was. I found no Hopkins in Bradford, Steuben Co., NY in the 1940 Census. 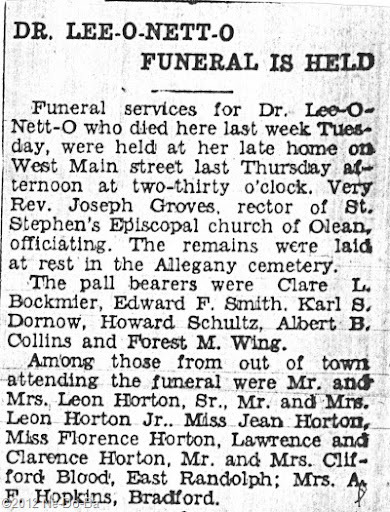 I did find a Hopkins family at Bradford, McKean Co., PA but not an A. F.. Dr. Lee-o-netto could have had long time clients and/or friends in either town. To learn more about this person will take more time then I am willing invest. I can always come back to it later if it becomes important. The more I learn about Dr. Lee-o-netto the more I am astounded by her accomplishments. She was an Indian woman openly advertising herself as Indian. She made a good living from her chosen occupation at a time when “Indian Doctors” are usually referred to as quacks and cons. She was living in a community which was openly condescending towards Native People from the local Seneca reservations (based on reading local newspapers for the time period). She managed her own affairs and died with a substantial estate. She didn’t die alone and forgotten, for it appears she was surrounded by non-Native neighbors who cared about her. And for her final accomplishment – her last journey on earth was in the hands of prominent citizens from her community.